ary Robinson and Constance Okollet, Chairperson of Osukuru United Women’s Network in Uganda and member of Climate Wise Women. Mary Robinson yesterday, Wednesday 30 November, met with members of the Trans African Caravan of Hope, including members of our Women’s Leadership on Climate Justice Network, Cecilia Kibe Coordinator the Pan Africa Climate Justice Alliance Women Caucus and Constance Okollet, Chairperson of Osukuru United Women’s Network in Uganda and member of Climate Wise Women. 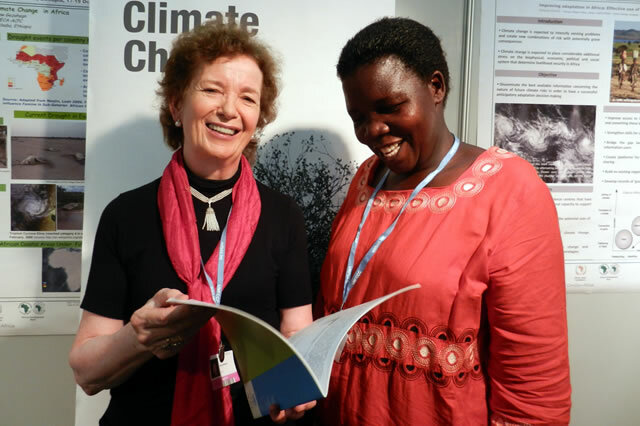 Members of the Caravan told Mary Robinson their experiences and their priorities for COP17. Paul Okongo, a fisherman and farmer from Lake Victoria in Kenya said farmers in Kenya are fully aware of climate change and that they act as barometers or ‘first detectors’ of the changes to seasons and weather patterns. He said he doesn’t understand why those involved in the negotiations “don’t make space to hear us, we are experts on the impacts of climate change”. Mailes Zulu Muile, a farmer and advocate for the rights of rural women from Zambia said that she doesn’t have a car, she doesn’t even have a bicycle, so why is she paying the price of climate change? She then carried their messages and stories to a gathering on Energy Access organised by the Carbon War Room. She told the group of entrepreneurs, thought leaders and prominent figures that the demand of members of the Caravan is for their voice to be heard so it can inject urgency into the negotiations. The Foundation is co-hosting an event with United States Ambassador-at-Large for Global Women’s Issues, Ms Melanne Verveer, on 8 December entitled “Unlocking the Potential of Women to Combat Climate Change: Moving from Words to Actions”. The public event will take place at the US Centre in the International Convention Centre in Durban at 10.30am-11.30am.